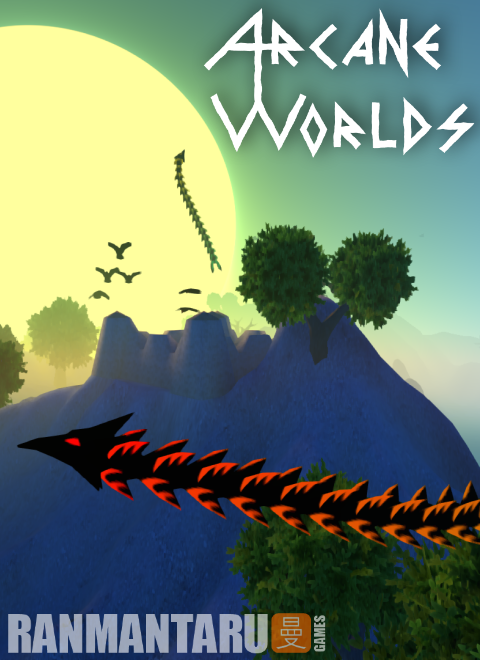 Arcane Worlds is a game inspired by Magic Carpet, with modern graphics and features, to name some: simulated water and lava, swarms of creatures, generated worlds. You play as a sorcerer, exploring mysterious worlds, changing them, discovering ancient secrets, creating new spells, fighting creatures and other mages, building and destroying as you please. Tree foliage now uses a much less detailed model in the distance, for performance. Tried to improve water simulation performance on some CPUs. Added rim lighting and adjusted land textures. Disabled stylistic post-processing effect by default, you can toggle it with F5. Sound volume instead of master volume in settings. Mana is now "wild" by default and should be claimed with the new Claim Mana spell. Gatherers only pick up mana owned by the player now, ignoring the wild mana. Player's maximum mana depends on the mana stored in the castle now. Player's mana regeneration rate now depends on the mana owned (claimed) by the player. Made gatherers pick up mana much more efficiently. Gatherers can be damaged and killed now, both by enemies and the player. Rebalanced spell mana costs and some other parameters. Extra mana (above castle's capacity) is now expelled from the castle. Added gatherer summon and death effects and sounds. Added gatherers' info to HUD. Mana, gatherers and player's missiles are now visible on the map. Added dotted line to the castle on the map. Spell icon turns semi-transparent now when the spell can't be cast. Made Fracture spell stronger and improved its effect aesthetically. Updated the tutorial to teach about claiming mana. Fixed items appearing inside menhirs sometimes. Added additional screen message with smaller text, mostly for the tutorial. 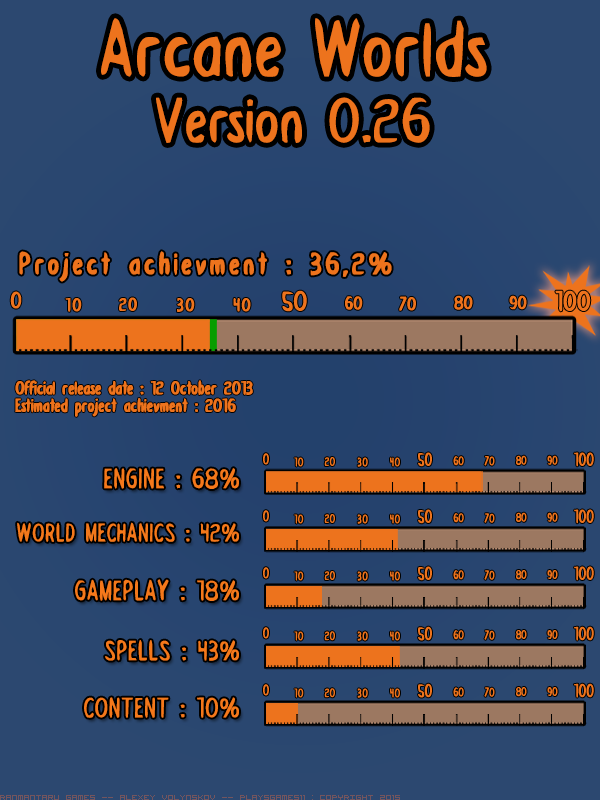 Added world gameplay time to script, also displayed on the performance stats screen. Changed the way C++ and Squirrel objects are linked internally. This game is not very CPU-intensive, but need some graphic card power. Integrated GPUs like Intel ones may not work. A-series APU from AMD should work. Arcane Worlds on Indiegogo ! Arcane World is now available on Indiegogo ! Come take a look at the perks here, or go directly to the Arcane Worlds Indiegogo page. 0.24 version of Arcane Worlds, adding a lot of new features and several bug fixes. 0.23 version of Arcane Worlds, adding a few of new features and several bug fixes. Installer for the 0.22 version of Arcane Worlds, adding few new features and several bug fixes. Installer for the 0.21 version of Arcane Worlds, adding a few of new features and several bug fixes. It would be nice if you would add an 'invert-y as'-function add to the game, because I like to play games when i go up with the mouse, the screen go up. So please can u add it? No, it'll still be available and updated DRM-free on my site, Desura, IGS store etc. You'll also get a Steam key if you buy it before it's released on Steam. I'm not sure about after that though. Unfortunately, it's still in flux so it's hard to tell the final system requirements. You obviously meet the minimum ones to technically run it. Set the graphics quality to "low". The game won't look as good, but should run much better graphics-wise. Press F2 to pause game logic updates. That'll stop water/lava simulation that takes a lot of CPU time. If it removes lag, your CPU is likely too slow. If not, video card is an issue. I suspect it might have performance issues with integrated Intel graphics, but I can't test that for now. Update 0.17 is awaiting authorization on Desura now, should be available in a few days. It has very basic story mode with universe map and saved games, but no real story features yet. Sorry, but my hard drive still in repair state, so I can't publish anything as I don't have any data, I can just upload the demo installer on the IndieDB page. No problem, it's not approved by Desura yet anyway. So indiedb became useless ?? RT @RainWorldGame: Rain World's first FULL PRICE WEEKEND continues! !